On July 24th, 1990, Rhino Bucket’s original line-up performed a blistering set at the infamous Coconut Teaszer on Sunset Blvd. in Hollywood, California. The set was recorded and aired on a prominent radio program, but aside from some scattered bootleg cassettes, the tapes were all but lost — until now! 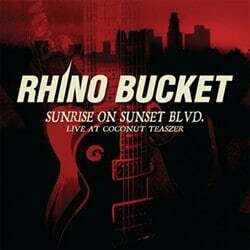 Remixed and remastered, ‘Sunrise On Sunset Blvd.’ captures the original Rhino Bucket line-up fresh off tour and at the top of their game — driving guitars, tight rhythms and big choruses. In support of the record, Rhino Bucket will perform their entire first album, as well as selected tracks from subsequent releases, on their upcoming European tour. ‘Sunrise On Sunset Blvd.’ will hit stores in February 2013 with pre-orders shipping in early January. For pre-order information, a sample of the track “One Night Stand”, and upcoming Rhino Bucket tours dates visit www.acetate.com. Four years ago, when Rhino Bucket frontman Georg Dolivo slipped in the tape of the band’s 1990 Coconut Teaszer show and pressed the start button, it not only gave him a window into his past, it offered an opportunity that had so far been eluding him and his bandmates: the chance for Rhino Bucket Past to meet Rhino Bucket Present. For a long time now, Rhino Bucket has been trying to get back the rights to their first two albums, their self-titled debut and 1992’s ‘Get Used To It’. Both were released through Warner Brothers/Reprise and both are currently out of print. But corporate forces have made it next to impossible for the band to have the recordings. Sure, the suits said, these albums are available… for a price: the kind of high price that your average small touring band could never afford. The unavailability of these two albums has frustrated Georg to no end. “Right now these CDs are on eBay for anywhere between 20 and 35 dollars and it just seems ridiculous.” Eric Coubard of Bad Reputation Records in France stepped in and worked with Warner Brothers Europe to obtain the two albums. WB Europe agreed… but WB U.S. didn’t, leaving them back at square one. Then former Rhino Bucket guitarist Greg Fields found the Coconut Teaszer tape. The show was recorded by Westwood One at the legendary 1980s and 1990s Hollywood club around the same time Rhino Bucket’s debut came out. As he listened, Georg had a flash of inspiration: why not have the band play the whole first album, in order, on their 2013 European tour and sell copies of the Teaszer show? Who needs Warner Brothers! “It’s gonna be fun!” says the frontman. “There are songs on the first album that we have not played for a very long time, certainly not with the current lineup.” And he invites everyone who attends to record the shows so they can compare Rhino Bucket 2013 with Rhino Bucket 1990. “This is an artistic journey,” Georg says, “so we’re not gonna show up and be a cover band of ourselves.” One thing fans can expect, however: “The level of commitment and quality has not changed.” As always, Rhino Bucket’s gritty, supercharged rock ‘n’ roll is guaranteed to leave audiences begging for more. After this fun foray into the past, the Bucket will release an album of all-new tunes in summer of 2013.